Sclerotinia stem rot (most commonly known as white mold), caused by the fungus Sclerotinia sclerotiorum, is a common disease of the brassica crop carinata. 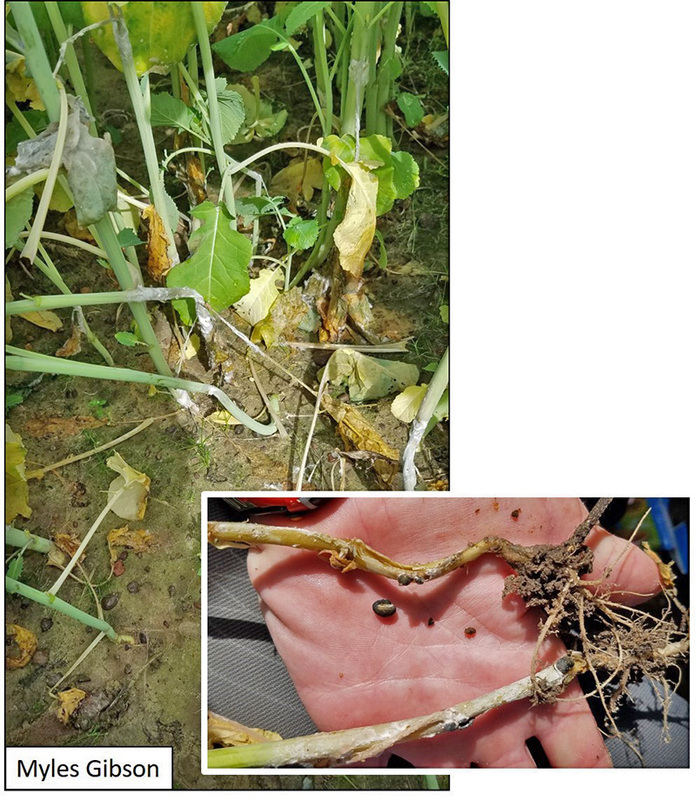 In the last 4-5 years, white mold was mostly observed on carinata as basal stem infections. This year S. sclerotiorum has been detected causing marginal leaf necrosis and leaf blight. This infection was first observed during mid-February in Georgia and later (mid-March) in the Florida Panhandle. S. sclerotiorum is capable of colonizing over 400 plant species, affecting stems, leaves and even flowers worldwide but is rarely seen on carinata leaves. The high rainfall conditions, prolonged wet soils and long hours of wet foliage this season are ideal for the pathogen to infect not only carinata stems, but also petioles and leaves. The pathogen, S. sclerotiorum forms 2-10 mm oval or irregularly shaped black survival structures called ‘sclerotia’. 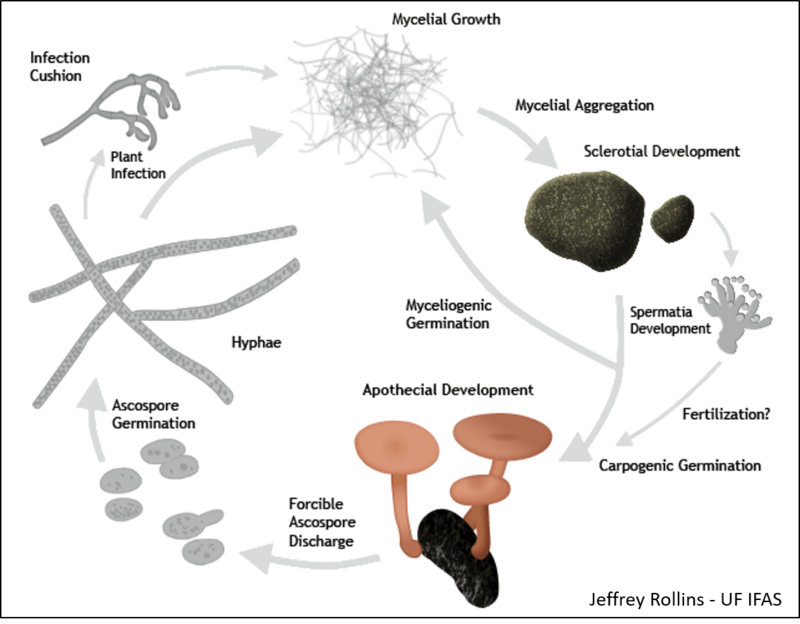 Sclerotia germinate to produce white mycelium or to produce fungal structures called ‘apothecia’ which later produce ascospores (Fig. 1). Young apothecia are light brown, but turn darker brown with age and produce fungal spores called ‘ascospores’. Ascospores can be blown with the wind or water splashes to nearby plants, or over longer distances to infect other plants/fields. This might be how some foliar infections started this year. Symptoms on leaves occurred as water-soaked lesions that expanded and moved down the petiole and into the stem. Some infections started with marginal leaf necrosis (Fig 2A and 2B), while others started in the middle of the leaf (Fig. 2C). Initial indication was the appearance of water-soaked lesions on leaves (Fig. 2C). The lesions developed into necrotic tissues. In some cases, presenting the characteristic fluffy white mycelium on the diseased tissue (Fig. 2D). Typical lower stem infections were also present on the same plant. 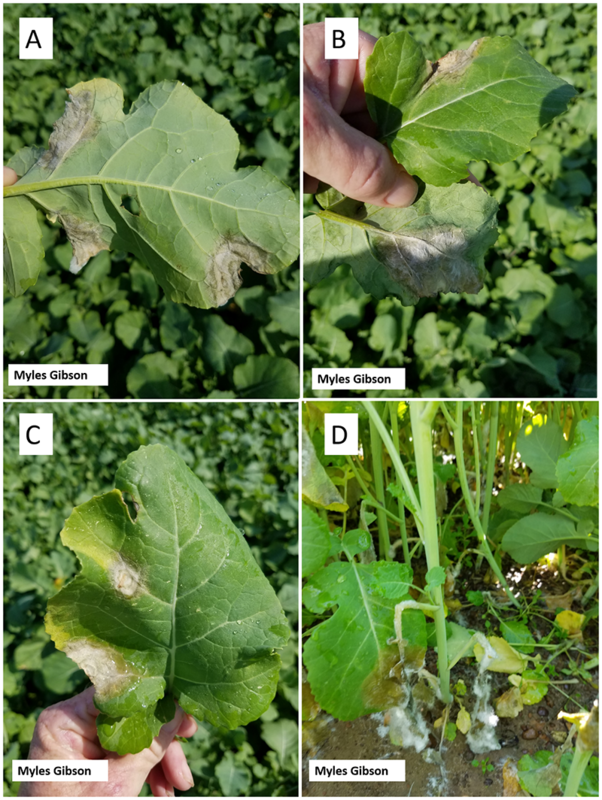 Stem infections usually start from the soil line and may eventually girdle the stem, or move up into leaf petioles presenting water-soaked lesions with or without abundant white mycelium (Fig.3). Older infections weaken the stem and can cause the plants to lodge. Closer examination of the inner stem of diseased plants usually reveals the characteristic black ‘sclerotia’ (Fig. 3) at later stages of disease development. S. sclerotiorum survival structures (sclerotia), which remain in the soil from previously infected plant residue are the primary source of inoculum. When the stem base or any part of the foliage comes in contact with germinating sclerotia in the soil it can become infected. Infection spreads to above-ground tissues and/or to the roots, and abundant white mycelium may develop when environmental conditions are favorable for disease development. New sclerotia are produced in infected stems under conditions of high humidity. Secondary spread from mycelium can occur between plants only when plants are lodged. Wounds, growth cracks, or other damaged host tissue may also provide points of entry for fungal invasion. Epidemics develop during periods of frequent rainfall that maintain soil moisture levels close to field capacity. When the crop canopy shades the soil, conditions become highly favorable for apothecial production (2-4 times during the growing season), which can lead to discharge of ascospores. Ascospores do not usually directly infect healthy leaves and stems, but can easily infect flower petals or other organic material adhering to the leaves, stems or branches. Petals or organic material provide the nutrients required by the fungus to develop and potentially infect other parts of the plant. Canopy temperatures of less than 70oF are favorable. However, temperature is rarely the limiting factor, if the moisture level is high. Like other Brassica crops, carinata should not be grown every year on the same field, but once every three years to reduce disease problems. In other crops affected by S. sclerotiorum, moderate seeding rate, wide row spacing and avoiding excessive nitrogen fertilization have been found to reduce disease incidence and severity. Control of broad-leaved weed species is also recommended. Sclerotinia leaf blight and basal stem infections can be controlled by foliar application of registered fungicides (Table 1). In oilseed brassicas, if the disease risk is sufficient to justify a fungicide application, the typical target window for applica­tion is between 20 to 50% bloom. If plants are damaged due to cold temperatures, but are expected to survive (evident by green healthy growing points) a preventative fungicide application may be considered to protect the damaged plants. For more information about carinata disease management, consult Carinata Production Recommendations. If you have questions about scouting or disease management for carinata, contact the authors of this article or Agrisoma. Heffer Link, V., and K. B. Johnson. 2007. White Mold. The Plant Health Instructor. DOI: 10.1094/PHI-I-2007-0809-01. Updated 2012. Compendium of Brassica Diseases. 2007. APS PRESS.